The church newsletter is a central part to informing and growing your congregation. But have you ever felt like your emails are missing something extra to keep people engaged? Perhaps you can't get the design right? Perhaps your short on ideas for what content to include? Maybe you're looking for what's working well for other churches? Or you're just starting up your church newsletter and looking for the best tips. Whatever your needs, we've got you covered in this post. Nobody wants to sit through paragraphs of text. Jazz it up with colours, images, GIFs, videos and quotes. It not only keeps people engaged, it's fun, fresh and makes you stand out from the crowd! 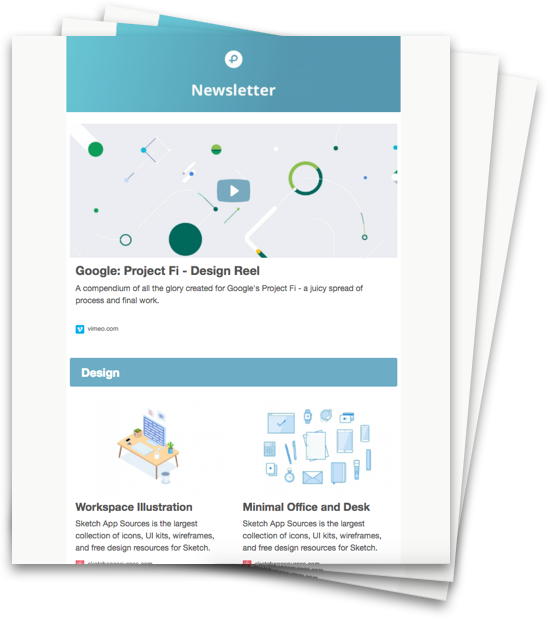 You can also break up your newsletter by using headers, and photos to support your copy. But make sure you use tools such as Reduce Images and Pic Resize to keep the overall email size low. More on why Image size is important in this email marketing strategy post. So many of us are on the go these days. So it's not surprising that we all want information that's quick and easy to digest. On average, we receive 147 emails per day! That's a lot of noise to cut through. If you want to stand out, keep your church newsletter short and sweet. Instead of including a full interview. Why not share a snippet of the interview? Then redirect readers to a page on your website to continue reading the full interview. Here, Uber share a great example of this. They use minimal copy with big call to actions encouraging users to link through to the website. You don't have to fill your church newsletter with text. You could use a graphic, video (if supported) or GIF to tell your story. Check out this example by Harry's. They created an awesome animated email by only allowing the clock face to move, simple but effective. Like in the example below. Story Matters have broken up their newsletter with content lists. Introducing the article with a sentence and image, and links to click through. We're emotional beings. We need something to pull at our heartstrings from time to time, but we also need a little bit of humour. Mix serious content with a bit of entertainment! Here is a great example by Beta List. When a customer unsubscribes. They send an automated email injecting a little humour! Now let's dive into some ideas for your church newsletters. We want to give you the BEST Church newsletter ideas. Ideas that will attract new members and engage with the existing. Not to mention inspiring people to become active members of your community. Inspirational quotes can pull at the heart-strings of even the toughest bunch. Not only are they thought provoking but they also add another voice to your newsletter. Quotes can comfort your readers if they are lost after a loss. Include words of healing, hope, love and abundance to uplift those most in need. God will never leave you empty, he will replace everything you lost. If he asks you to put something down, it's because he wants you to pick up something greater. Something as simple and beautiful like this works wonders. We created this quote using a tool called Canva. Which is a great way to create visuals for your newsletter. Including a message from the pastor is pwoerful. It's the perfect opportunity to share stories and words of encouragement. This is a great example by Passion City Church. Where Pastor Louie shares an inspiring message to his community. Now, don't worry! We're not saying you need to create a fancy video like this. But what we do love about this message, is that it's unique, it's welcoming. Here's another one we love. From Pastor Mark Connor. Interview other teachers, choirs, musicians, authors and artists. It's not only great content, it makes the work so much easier for you. The person interviewee creates the content with their answers to your questions! Content like this is especially great if you have special guests coming to the church. It gets people excited, helps people to get to know each other and make lasting connections. It's also great for attracting new members to the church. If they can see that you have exciting events coming up. We all love to hear about the latest news that our community is involved in. It makes us feel proud and part of something, a family so to speak. A short ‘what's on' is a great little roundup to include in your church newsletter. It gives newbies an insight into upcoming events. But it also excites existing members with an calendar for the weeks/months ahead. Depending on how frequent your church newsletters are and how large your church is. Include mentions of weddings, christenings, projects, concerts, shows & unique performances. Here's a great example from CityLife. A highlight reel of the churches upcoming events. Some churches may wish to reflect a theme in their newsletter. You may highlight certain passages, support a sermon series or share a scripture. To encourage bible memory, add a different memory verse in each newsletter. Avoid using stock photos as much as you can in your newsletter. Members want to see real-life action shots. Photos of worships, church fundraising days and other events. If you can include videos or GIFs you're onto a winner! According to studies,the average viewer remembers 95% of a message when it is watched. Whereas only 10% when read. This is a great opportunity for you to welcome new members or make any other announcements. Keep things concise, easy to read and inject some personality! Lighten up your newsletter with a little bit of humour. These funny church announcements really tickled us. If announcements are a little more formal, include the 3 W's. what, where and when and be clear about the main call to action - what action do you want people to take? Like most churches, people come far and wide to pray, to talk to god and be part of a community. If you're active in the local community make sure you shout about it! Not only will this be a guarantee way to attract new members. It keeps the existing church-goers happy if there are always lots of projects to get involved in. You want to promote social action, community empowerment and social inclusion. If you've not yet embarked on local projects, here are our top 5 favourites! Community Easter egg hunt: Keep kids (and adults!) entertained with an Easter egg hunt. Local Heroes Day. Invite Police Officers, Firefighters and other emergency medical personnel. A lot of churches nowadays are saying goodbye to paper newsletters. Not only is it bad for the environment it's costly too. Not to mention everyone has a smart phone. Give a brief update about why you've gone paperless and how a new online newsletter will be the future! This is a great opportunity to ask your existing community to sign up to the digital newsletter. You can also ask them for feedback, what they'd like to see more of, less of? Hopefully after reading this you'll be able to give your church newsletter a real refresh. As well as being inspired with all of the newsletter ideas to get you started.